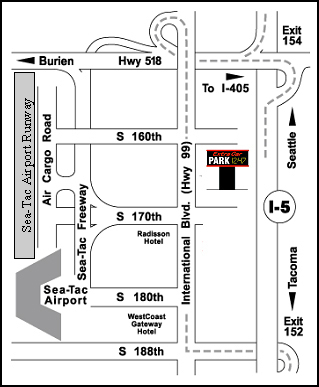 Extra Car Airport Parking, Inc is located 3 blocks from the terminal on International Blvd, also known as Highway 99. Directions to our location at 16300 International Blvd. From I-5 Southbound, take exit #154 (toward SeaTac Airport/518 Freeway Burien), take the Hwy 99 South exit. From I-5 Northbound, take exit #154 (toward SeaTac Airport/518 Freeway Burien), take the Hwy 99 South exit. From I-405, take the Hwy 99 South exit. Proceed south on Hwy 99 South, also known as International Blvd. We are located on the left side just past the second traffic light. NOTE: Because it is a divided highway, proceed to the third traffic light and make a U-Turn when you see Motel 6. Beware of interactive driving directions from Yahoo and MapQuest. They say to make a u-turn at the wrong street, causing our customers to go the wrong direction on SR 99. Make your u-turn at the Motel-6 south of 160th. What if a system error occurs when you book your reservation?